Hirschdale on the Truckee River. Click to enlarge. 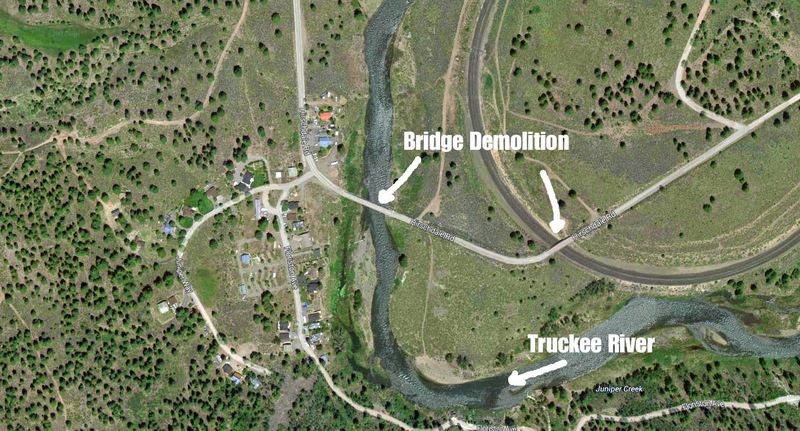 Nevada County had plans to demolish two road bridges over the Truckee River and the Union Pacific tracks in Hirschdale. The bridges were built in 1926 and in need of seismic retrofit. There were no plans to replace the bridges, but alternate access to the area served by the bridges was proposed. Public comment for maintaining the bridges identified significant project issues. As a result, the County is no longer considering bridge removal. The two bridges will remain in place and be upgraded for seismic deficiencies. The County is working with Caltrans for funding authorization. If approved, preliminary design for both bridges should begin in early 2016. The Tahoe-Pyramid Bikeway would have been severely affected by the demolition of the bridges. Loss of the bridges would have added a 4 mile detour and a 500 foot climb to the route. To minimize costs, the bridges may be narrowed to a single lane with appropriate shoulders. For questions or comments you can contact David Garcia, Jr.,Transportation Planner at 530-265-7038, or at david.garcia@co.nevada.ca.us.